CountDownr is a basic iPhone app the lets you set and track personalized countdown clocks and reminders for major events and edit them on your iPhone. Supports adding and editing your own custom countdown reminders with sound alerts. Also you can import events from your Google Calendar. 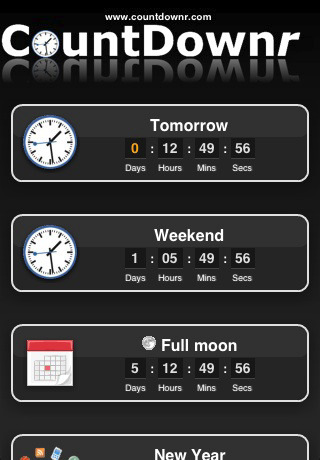 You can set countdowns for any date and time which can be repeated daily, weekly, monthly or yearly. Event countdowns automatically get set for the next event after each alert. Countdownr is not too powerful nor does it have a ton of features. It’s just a basic app for setting up countdowns, which could be good for people who want to setup reminders for upcoming events. AppSafari review of Countdownr was written by Joe Seifi on November 16th, 2009 and categorized under App Store, Calendar, Productivity, Utilities. Page viewed 4104 times, 1 so far today. Need help on using these apps? Please read the Help Page.